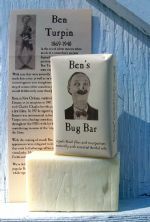 Crazy cross-eyed comedian Ben Turpin is perfect for our famous BUG BAR soap and you'll be happy to know it's exactly the same as our Sportsman's Bug Bar. I just couldn't resist adding the fly to his nose, how perfect! You'll love reading about this funny man as well as using this fabulous soap which has been so effective for so many people in helping to keep black flies and mosquitoes from biting. With regular use, it leaves a scent on your skin that you won't detect but the bugs will and they'll "bug off" to bother someone else! A great refreshing deodorant soap at any time of year but be sure to use it throughout the bug season. HINT * It's a fantastic soap for your pets too, especially horses, goats and dogs to help them fight the same bugs that bother you! Essential oils repel bugs, aloe vera soothes already itchy skin. This may not be a scent that was popular in the 1920's but I'll bet they would've loved how effective it is!